This repair kit is for 1990 and newer 9.9 thru 155 model Evinrude® and Johnson® outboard motors without the VRO2® Oil Injection System. Some of the parts in this kit are not used in some applications. Discard the extra parts. Ref. P/N Name of Part Qty. 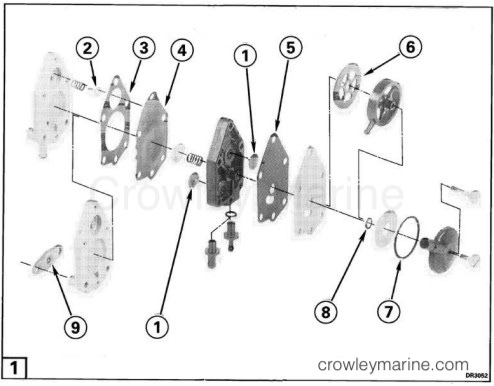 Disassemble your pump carefully, taking note of the position and orientation of each part. Place a drop of oil on the stem (A) of each check valve. Install the check valves by pushing the stem thru the center hole with your finger tip or a pencil eraser until the enlarged head (B) is thru the housing. NOTE: Do not use your fingernail, a pencil point, or ANY OTHER TOOL to install check valves or valve damage and premature failure will result. Do not assemble check valves into housing dry, and do not pull valve stem thru housing. Never reuse a check valve after it has been installed and removed. Removing a check valve damages it and reusing valve will result in premature pump failure. Reassemble pump, hook up a fuel tank and squeeze primer bulb to check for leaks. Fuel leaks could cause fire or explosion. Repair any leaks before operating motor.